Atherstone is an ancient town on the famous Roman road, Watling Street. That the Watling Street runs through the town was confirmed in 1868 when excavations, for the purpose of installing a town drainage system, revealed huge blocks of stone, laid by the Romans. Deep tracks made by the wheels of chariots were plainly to be seen. In the Doomsday Book Atherstone is spelt "Aderstone"; the name is probably derived from a Saxon farmstead (tun) owner named Aepelred (p=th).... and so Athelreds Tun. Many Saxon settlements arose at strategic positions such as where two important routes crossed and Athelred’s Tun was the crossing of the route between Derby and Ashby to Coleshill and Oxford. 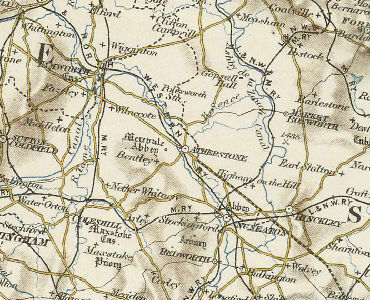 In the late Saxon period, just before the Norman Conquest, a large area of Atherstone and its open fields and woodlands belonged to the Countess Godiva. Following the Conquest, Hugh Lupus, Earl of Chester, gave the manor of Atherstone to the Monastry of Bec Her Lonin in Normandy. The Monks of Bec believed Atherstone to be in an advantageous trading position and proceeded to establish it as a market town. While they were mainly concerned with the economic role of their manor, the spiritual life of the inhabitants was not neglected. A chapel was built in 1155 on twelve acres of land near the Market Place and agreement was made with the parson of Mancetter for regular services in the chapel. About the year 1357 this early chapel became the site for the church of an Augustian Friary. This Friary church, completed in 1385, forms the Chancel of the Church of St. Mary. At the Dissolution of the Monastries in 1538 this chancel ceased to be used for worship although the old nave was kept as a church. 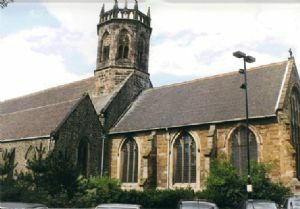 Following the granting of a school charter in 1573 the disused chancel became the home of the Queen Elizabeth Grammar School and continued in this use until 1864. The building of the present nave commenced in 1848 and it was dedicated on 14th March, 1850; it cost £3,000 and seated 1400 people. In 1884 the chancel was restored, joined to the nave and dedicated in 1888. 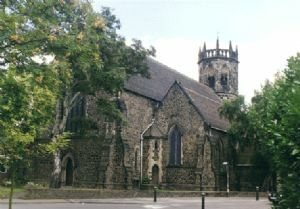 The Parish Church of St Mary dominates the North side of the Market Square in the centre of Atherstone. On the left of the tower is the huge Victorian nave rising over 18 metres above the ground and in front of the nave is the South Aisle. To the right of the tower is the much repaired 14th Century chancel. 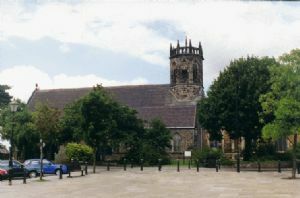 The clock face was moved from the NE aspect of the tower to the South face when the present road was driven through between the church and the Market square. From this angle the West window and West door are visible. The small ‘tower’ tucked into the angle of the nave and South aisle was the only means of entrance, up to a balcony at the West end of the nave, and down to the boiler house under the ground. The balcony no longer exists, being replaced by the much larger balcony on the roof of the Lounge. "The Baddesley Porch", on the North side of the church, was erected soon after rebuilding as a private entrance for the occupants of Atherstone Hall. It is twelfth century and came from the old Baddesley church after its demolition in 1842. Prior to the Battle of Bosworth, the Earl of Richmond lodged at the Three Tuns hostelry in the town and received sacrament in the church on 21st August, 1485, the eve of the battle. This final battle of the Wars of the Roses was won by the Earl of Richmond and he was crowned King Henry VII thus beginning the reign the Tudor dynasty. Five hundred years later, on 27th June, 1985, their Royal Highnesses the Prince and Princess of Wales visited the town and St. Marys on the 600th anniversary of the completion of the church and the 500th anniversary of the Battle of Bosworth. 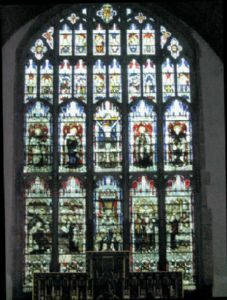 Designed by Kemp, the great lights of the window depict in the centre, Christ Crucified with St. Peter, and Mary the Mother of the Lord, on the left, and St. John and St. Paul on the right. - The Presentation of Christ in the Temple, depicting Anna, Simeon and Joseph. - The Offering—" A pair of turtle doves or two young pigeons ". The smaller lights at the top of the window, beginning at the crown, illustrate the emblems of the Passion, such as the Reed and the Sponge, the Three Nails and the Seamless Robe, the Three Dice, the Scourge, the Ladder, the Pincers and Hammer, the Pillar, the Cross, and the Sacred Monogram. Others represent the Prophets - Isaiah, Zechariah, Daniel, Micah - and others. The two visible plain lights at the base of the East Window are completed with the same design as in neighbouring lights. Several of the lights bear inscriptions to the memory of former citizens of Atherstone, including Frederick Hartshill Riching, its first Vicar. The altar in this chapel came from St Scholastica’s Priory in Atherstone and was presented to St Mary’s by the Prioress, Reverend Mother Flavia Bunce O.S.B. Upon the dissolution of the Priory in 1968. The panels on the altar depict Christ’s Nativity; the centre panel shows the baby Jesus on Mary’s lap; the left hand panel shows the shepherds and the right hand panel the Wise Men bearing their gifts. 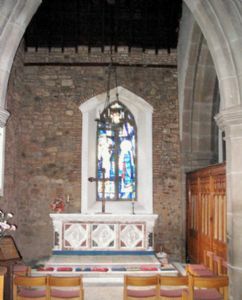 Hanging above the altar is a sanctuary lamp, also from the priory. The fine stained glass window was installed in 1972 and depicts the Annunciation. Buried beneath the altar are relics reputed to be some of the bones of St Lucy after whom the chapel is named. at Leicester. It weighs about 14cwt (715Kgm). In the inventory made of all monasteries and friaries by Henry VIII in 1535 before the dissolution, the only valuable items noted are a chalice and a bell. “It is agreed that from the feast of David and Chad (the first and second days of March) unto the feast of the Nativity of our Lady (being the eighth day of September) the hours of the scholars meeting in the morning shall be six of the clock, and from the said feast until the first of March again, seven of the clock, when at the tolling of the bell the scholars shall assemble and so continue until eleven, and at twelve o’clock again assemble. Because the crown had been broken at some time, the bell had not been rung properly for a long time, i.e. with the bell rope turning the wheel which turned the bell right over and back again. Instead a small hammer inside the bell had been made to strike the bell by pulling on a small rope. 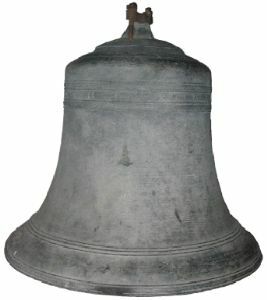 The present peal of eight bells, lighter in weight, replaced the old Friary bell in 1960. The inscription around the bell is in Latin and is translated as ‘Jesus of Nazareth, king of the Jews’. Those who remember it say that when the old bell was tolled for a funeral it sounded a truly awe-inspiring note of doom. The Nails, Hammer and Pincers. The Eagle of St. John. The heavy cover is carved from oak and is counterbalanced by iron weights (cast in the shape of medieval bellringers) on the end of chains which run over pulleys. 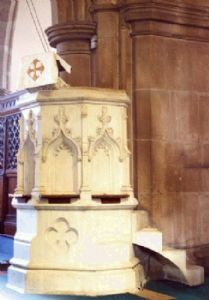 The stone pulpit was installed at the rebuilding of the nave and was raised to a height consistent with addressing some 1,400 people. It has stone steps which led straight from the vicar’s stall which was jammed into the archway. The top rim of the pulpit still has the bases for candlesticks which were set on either side of the preacher. It also has a curious cut-out in the stone rim, just to the right of the adjustable lectern, which was made to take the preachers pocket watch - presumably to ensure that the sermons were not too short! "The Baddesley Porch"on the North Side of the church leads into the East end of the North Aisle. 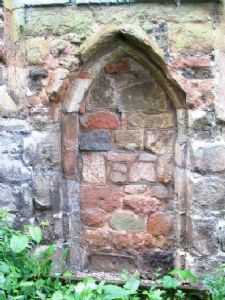 It was originally used as the private entrance from the old Atherstone Hall which stood in its own grounds some 200 metres to the North of the church. The porch was probably erected soon after the rebuilding of the nave. It dates from the 12th Century, and came from the old Baddesley Church, pulled down in 1842. At the Dissolution of the Monasteries in 1538 it appears the chancel was no longer used for worship but may have been used as a school. Certainly it was the home of the Queen Elizabeth Grammar School from the granting of the School's Charter in 1573 until 1864 when the school was moved to new buildings further down Long Street. 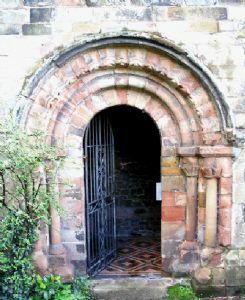 This doorway is all that remains of the two entrances that were used, the other being under the then smaller East window. From 1864 it was little used until 1884, when its restoration was commenced and it was joined to the present Nave. The Church Tower is octagonal and of massive proportions. It was part of the original Friary Church and was rebuilt in 1782 at a cost of £145, the work being done with Attleborough stone. The drawing in Bartlett from 1791 shows eight pinnacles as now. Three of the pinnacles were replaced in 1828 at a cost of £10, and the pinnacles were again replaced in 1848-50. The tower was restored in 1931-32 at a cost of £615 Is. 7d. The new ring of eight bells was added in 1961 at a cost of £2,500.